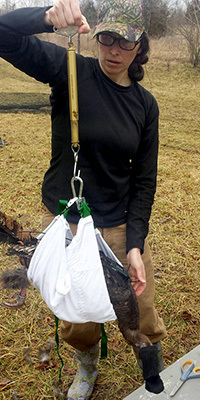 U. of I. graduate student Christine Parker studies wild turkeys. Catching them is a challenge. The hood on the bird’s head calms it while the researchers work. 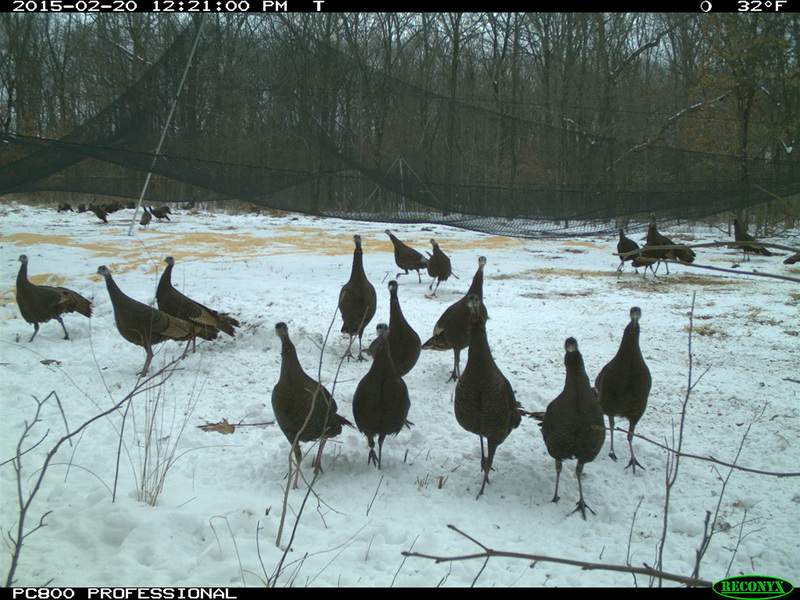 These wild turkeys set off a camera trap near a baited net. The turkeys eye us warily and scurry into the forest. Every winter since 2015, my life revolves around cracked corn and wild turkeys. In 2015 and 2016, my crew and I captured 90 of the birds in forests around Lake Shelbyville and the Stephen A. Forbes Recreation Area, both in Illinois. We catch them by luring them into our traps: drop nets set up over bait piles of cracked corn. When we catch the hens, our target, we weigh and measure them, band them, fit them with micro-GPS units and let them go. This allows me to study the birds and learn about their habits. 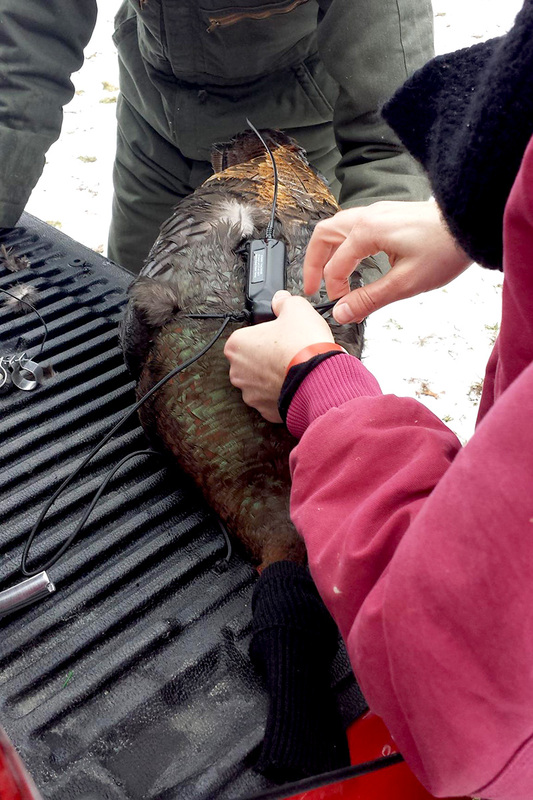 Parker ties a small global positioning unit on a turkey’s back. This allows her to track how the bird moves through the forest. 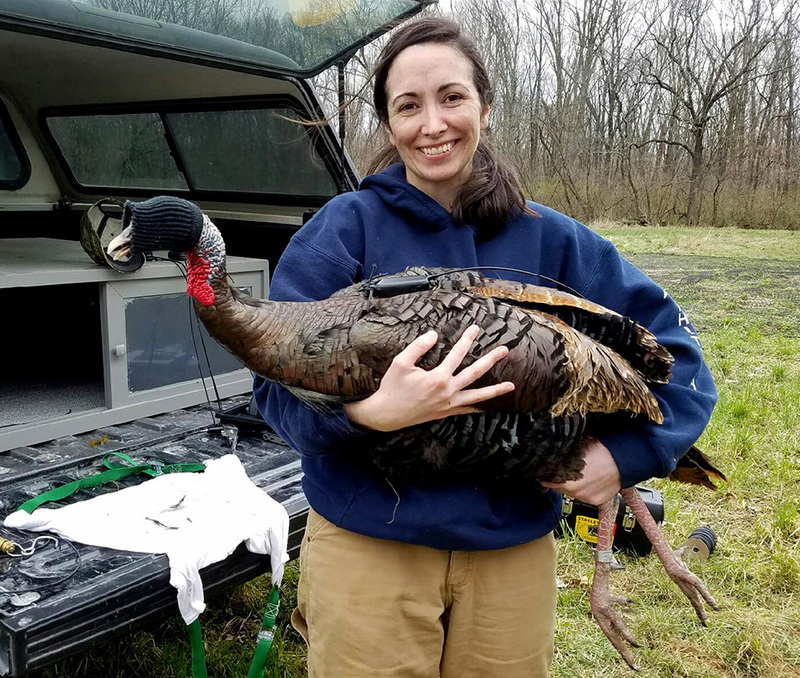 As a graduate student and avian ecologist in natural resources and environmental sciences, I am interested in how different habitats help or hinder turkeys’ reproductive success. 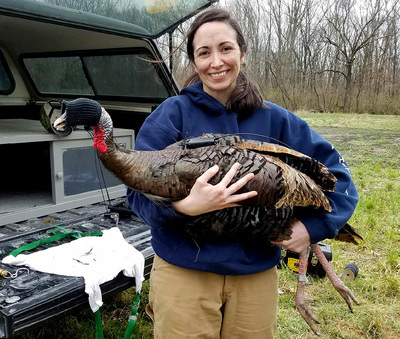 Wild turkeys are not endangered or dying out, but environmental officials want to know how forest management may be tailored to increase turkey populations and harvest. 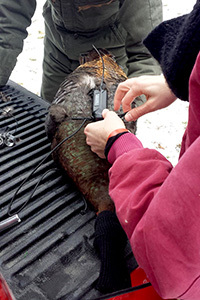 Parker weighs, bands and measures each turkey hen the team captures. This season is different, however. We’ve caught only three wild turkey hens this year. My advisor, Illinois Natural History Survey avian ecologist Jeffrey Hoover, has been supportive, particularly through this troubling season. Once everyone else is out of the truck, crew leader Morgan Womack shifts into drive and accelerates. “We need to get you back to the blind quick!” she says. When she stops, I leap out, swing my pack over my shoulder and run as fast as I can. I scurry through the tangled camouflage fabric that we used to create a blind, huddle into my damp seat on the ground and whip out my phone for reports about where the turkeys are. I see texts from Morgan. I carefully peek through the oak-leaf-shaped holes in the blind. There are no turkeys here. Morgan’s texts are a few minutes old. Somehow, I missed the birds, probably when I was crashing through the forest to get here. 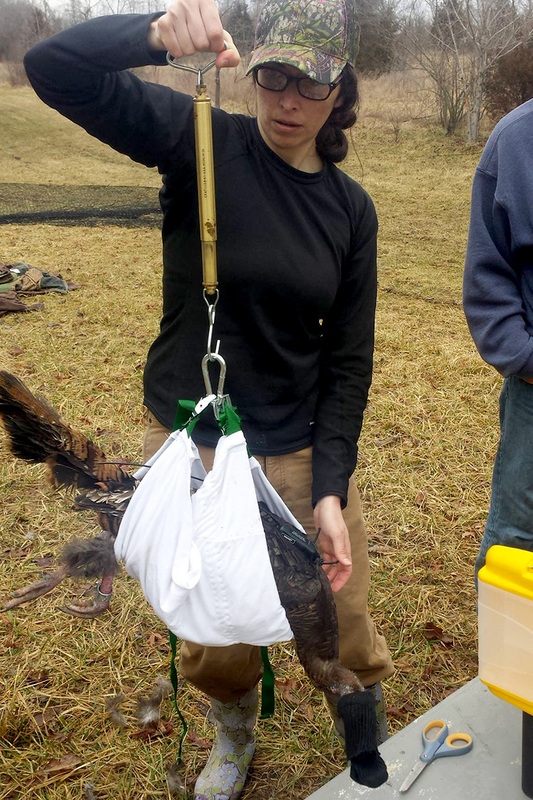 This year started out promisingly, like the others, with flocks of 20 or more turkey hens visiting two of the 16 bait traps we set up in the forest. But the birds kept eluding us. We strapped infrared cameras to trees near our traps to sense and photograph the birds, but the turkeys are visiting the sites only intermittently. In addition to bait, we’ve tried luring them to the traps with turkey calls, decoys and, now, herding. None of it seems to work. What’s different about this season? I think I know: acorns. Last year was a mast year for oak trees, which means they produced a bumper crop of acorns, an important food source for turkeys, especially during winter. Our damp corn dunes in open fields probably lacked the appeal of gorging on acorns in the relative safety of the forest. The birds are on to us. Let’s hope next winter they’re hungry enough to settle for corn.